Somewhere in Cardinal Nation, fans are sad. Elsewhere in Cardinal Nation, fans are elated. Skip Schumaker has been traded to the Dodgers for Jake Lemmerman. Schumaker had become a bit of a crux of the saber versus scrap argument in St. Louis. Below average defense at second base, an “empty” (and declining) batting average, and continuing to receive sizable playing time despite perceived better options were all at the base of the arguments against Skip. On the opposite side of the spectrum, Schumaker was by all accounts a clubhouse “glue guy,” he had flashes with the bat (remember, the move to second base was as much about Schu hitting .300 year in and year out as it was a lack of options), and piling onto that clubhouse rep he was perceived as an unselfish team player by agreeing to move to second base prior to 2009. Now, the truth probably lies somewhere in between, as is typically the case in these conflicts. The Cardinals are a pretty smart organization, so I can’t imagine Schumaker having been around as long as he has and logging as many innings as he has without providing value. Indeed, of his “full-time” seasons, the ones in which he was not an injury or late season call up (so from 2007 on), Schumaker posted a negative WAR only once, in 2010. That’s not to say he was putting up huge numbers in the positive seasons, but he did max out at 2.5 fWAR in 2009, and even managed 1.8 fWAR in his first season at second base in 2010, despite giving up almost 12 runs defensively. Likewise, Schumaker’s no fool either – the move to second base that he’s won praise for as being an unselfish team player also meant he could virtually guarantee himself at-bats at a time that he was being squeezed out of the outfield picture. Make no mistake, the waning months of 2012 were a bellwether for Schumaker’s future with the Cardinals, his playing time cut as younger and better options emerged. 2013 was going to be no different, and for the upcoming season’s version of the Cardinals, Schumaker’s value would primarily have been in his clubhouse presence, veteran leadership. Yes, Schumaker asked for an opportunity elsewhere, but I have no doubt that had a fit for such a deal not existed, Skip would’ve showed up to Jupiter with the same great attitude, ready to help in any way that he could. That’s what I’ll appreciate about Schumaker, what I’ll remember – not the pot-shots at his expense because of defense or otherwise, but the fact that he persevered and, as many have noted in their obits for Schumaker’s time with the Cards, he embodied “The Cardinal Way.” A guy who many couldn’t believe (and some hoped he wouldn’t) would stick with the club year in and year out just kept racking up at-bats and hits. 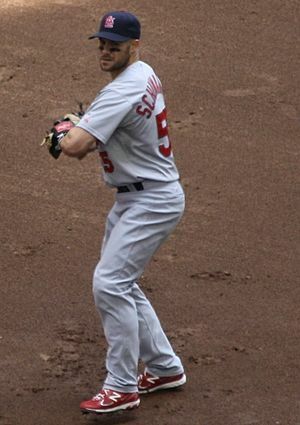 To wit, Schumaker ranks 15th all-time in games played at second base for the Cardinals, with 412. That’s just behind Luis Alicea, and a little ways ahead of Aaron Miles. Again, that’s just his games played at second. Not bad for a guy who wasn’t a second baseman. As for Lemmerman, he helps an organization depth challenged in the middle infield. For all of the character reasons above, this deal was less about the return and more about accommodating Schumaker’s desire to have an opportunity to play, to be close to home. It’s the organization paying him back for being a loyal foot-soldier. Lemmerman doesn’t light up the eyes of prospectors in the least, but he serves a purpose, in multiple ways. Good luck, Skip. Enjoy being close to your family and friends.